Tails From Provence answered my question about French horse show ribbons with the post Loot. She ended with, “Would any of my friends from other countries like to weigh in with their stories for comparison?” Talk about ribbons? Sure! In the US, the ribbon colors are consistent: blue, red, yellow, white, pink, green, purple, brown, gray, baby blue. The average show awards through six places. Bigger shows &/or bigger classes go deeper into the colors. After 10th, the colors are up to the organizer. Rolex gives ribbons to 20th. The ribbons for 11th through 20th are the same baby blue as 10th. One assumes the prize money checks are different. When Big Ben won the World Cup in Tampa, the ribbons went down to 20th, each one a distinct color. I remember seeing orange. 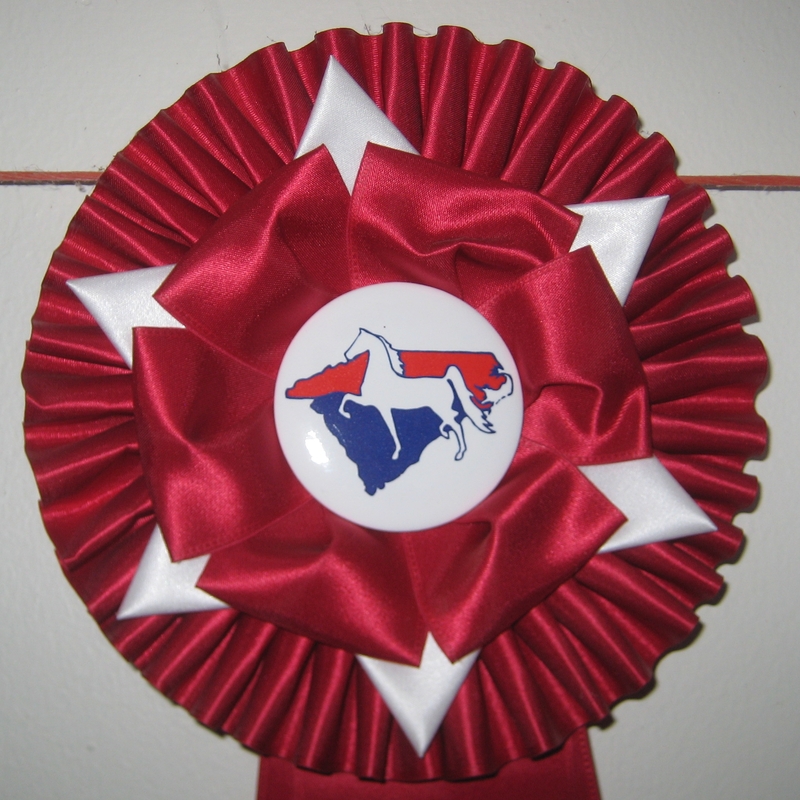 The standard horse show ribbon is a rosette with three 8″ streamers. Different levels of effort go into the ruffles at the top, the style of button, and amount of show personalization on streamer and button. Eventing gives fancier ribbons as they only buy one set per division. Saddle seat is off the charts on both quality and size of ribbon for the simplest of classes. Championship ribbons are proportionally larger and longer. At shows where the riders are expected to ride in many classes (hunters), generally no prizes are given for winning a single class. The division champion might get a trinket. At shows where the classes entered are fewer, the trinkets are more prevalent (saddle seat, sidesaddle, Intercollegiate). The bigger the show, the bigger the trinket. Year-end or series prizes run to coolers, halters, saddlepads, frames, and silverplate. Jumpers are more likely to give money than hunters, dressage, eventing, and so on. Usually the last class of a division is a classic or stake of some sort. The amount is small but pleasant. Money increases as the fences get higher. OTOH, the shows that give big money also cost big. Does anyone really make a profit on horse show prize money? My biggest checks have come two years in a row from National Academy. Woot! US readers: Does your experience differ? Aside from saddle seat, this is all from back in the day. Has it changed? How about other disciplines: Western, breed shows, Endurance? International readers: What ya got? Back years ago, hunter divisions at one big show we attended used to give out crystal cups for first place and the punch bowl for the championship. Depends on the show really. I much prefer the saddlebred philosophy: when you get an award at a saddlebred show, you really know you have an AWARD! From wxperience on the US Quarter Horse circuit, the ribbon colors are the same for all US placings I believe, but sometimes are subber out with plastic cups of appropriate colors, with the organizarion logo on them. At leaat those you can use! For year end awards, we got top five in the state in two events, which received and unbrella and a garment bag, both with year and organization on them. Wow, I see spell check isn’t working today, sorry! In the first version that was posted, I misspelled Tails (from Provence). Duh. Usually good advice. Would not have helped with Tales/Tails. Also, have you found that some word patterns sound okay but don’t read well? 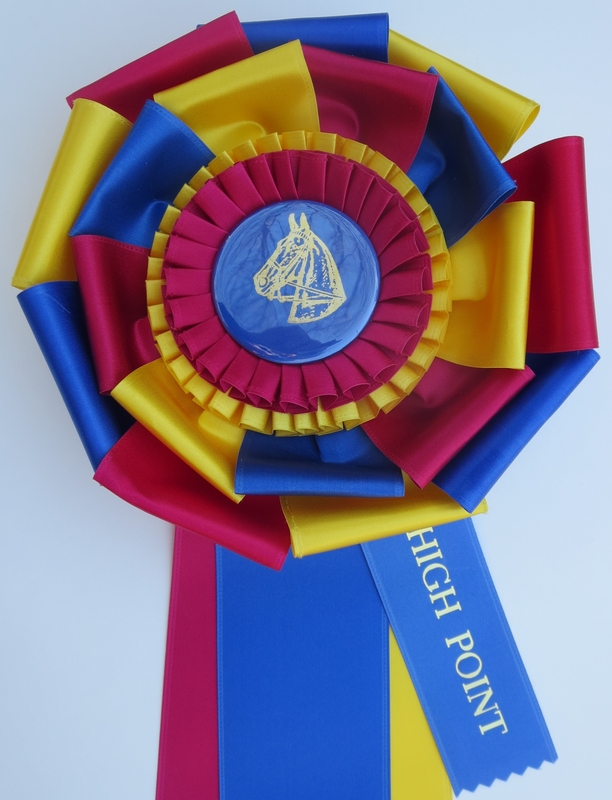 I saw a really super-fancy rosette at my friend’s house today, which her little girl received for 7th place in a large end-of-year show jumping competition. Big, four tiers of red white blue and silver, a silver bow, long streamers. The class was sponsored by Coolmore stud which is why it had such fancy ribbons… but it’s a keeper for sure. It is rather interesting how different each country is! And each discipline too, I’m sure. I will ask her, watch out on Facebook! I have a chart of which colors go with which placings all over the world. would be glad to scan it and send it email or snail mail. Yes, that would be fascinating! The Wiki chart of horse show colors is really good, might want to try there as my chart is pretty much the same. Don’t know where i got mine, might even have been Wiki…. Reprinting comments that got buried. Comments now trimmed to 5 levels. If you run out, just start a new thread.